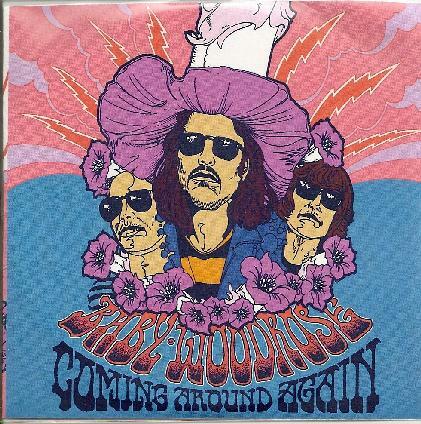 Baby Woodrose - "Coming Around Again/I Feel High"
Baby Woodhouse are a band that absolutely wear their colours on their sleeve, meaning in this case the psychedelic art on the sleeve of their new CD single. The flowers, shades and Haight Ashbury lettering show that it is still 1967 as far as this Danish three-piece are concerned. Formed in 2001 by guitarist Lorenzo Woodrose (aka “Guff“), who was soon joined by Woodrose “brothers” Riki (“The Moody Guru”) on bass, and Rocky (“Fuzz Daddy”) on drums, the band have released four albums to date, including a covers disc where they tackle the likes of Love, The 13th Floor Elevators, and The Stooges. Those cover selections are a pretty good indicator of the sound on the Woodrose single, featuring two tracks that were left off 2007’s “Chasing Rainbows” album. Both tracks are short and sharp, making the disc a quick listen at under six minutes in total, but those six minutes are chock-full of amazing fuzz-toned psychedelic garage pop. The upbeat and optimistic “Coming Around Again” features multi-layered jangling guitars with vocalist Lorenzo actually sounding like a young Robert Plant on the opening lines. Flipside “I Feel High” is more restrained with Doors-style organ and acoustic guitar accompaniment (apparently a full band version was initially envisaged before it was scaled back). With a sound and lyrics as cheerful as they are hedonistic, this release on the appropriately-named Bad Afro label a Nugget in every sense of the word, and a teaser for those interested in checking out the wider world of Woodrose mayhem. For further information see http://www.myspace.com/babywoodrose. Visit the Bad Afro Records web site at: http://www.badafro.dk.